To say my gardens have “naturalized” is putting lipstick on the pig. Over the years, when I had money but no time, they were tidy but limited to whatever the previous homeowner had done. My role was purely maintenance. My mother sent me 50 tulip bulbs the first summer I lived here. The second, when she asked what I wanted for my birthday, I replied an old-fashioned deep purple lilac bush. Both the bush and the bulbs have done their best under the circumstances for the past 8 years but have never thrived. I live on a ledge. The topsoil is minimal and the granite surface is unforgiving. Lush gardens demand attention. Hell, even growing crabgrass is a challenge! Container gardening and “naturalization” are the key to color around here. When Alice and I went out on our errands Saturday, my mind was running through a budget of what I could splurge on and where I would get the most bang for my meager bucks. We stopped at the dump first and she reveled in the smells of the “recycling” station. The grain store plants proved scarce and the potting soil was expensive. I was willing to at least pick up window boxes but the line was out the door with weekend gardeners. I reined in my expenses once again. We found a lovely central spot for Alice near the cart return at the grocery. She meditated on the silly human behavior while I shopped. She never barks. I have snuck up on her many times wondering if she threw a fit like so many dogs in cars at the store. Instead she harrumphs to herself in her version of Chinese. I still had to pass one nursery on the way home and the bright riot of pansies drew me in. Alice sat watch over the groceries. The prices were about half and the choices were young but healthy. I may be surprised with what blooms as I bought the mixed seedlings blindly. When I came home and put my glasses on to read what I had purchased, I realized most grow quite tall and are not recommended for containers; Gazinias, Salvia, Stock, Dahlias and Cleomes. Alice as rewarded with a sunny back deck and a marrow bone while I hauled pots, soil and plants around to the warm front deck. I planted and dug and drove the dirt deep under my nails for a couple of hours. This entry was posted in memoir. Tagged flower pots, flowers, gardening, life after 50, memoir, New Hampshire gardening, The House by the Side of the Road. Previous Post Previous post: Long live the Queen! Hooray for poppies! I have some lovely orange ones I’m hoping will “pop” soon!! Fingers crossed your container gardens thrive and bring some cheer to you and the bees. Thanks Marie. There is little to no pollen flow at the moment so I am feeding them like crazy. Hope to see blooms soon!! 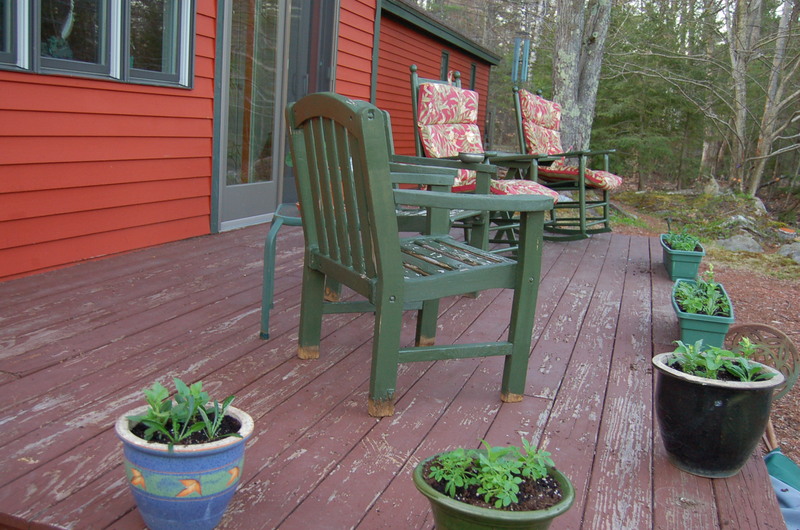 Your deck looks so cozy and inviting! Hoping to do some container planting soon – if we could just stay put one of these weekends!! Thank you Julie. I sat and listened to the bears hooting and calling across the valley last night. I do so love my humble little abode in the warm months. And no snow in sight! Looks like an absolute dream, and definitely worth a few dirty fingernails. Love the dirt under my nails, Susan. The smell of fresh turned earth is the best perfume on in the world! In a month you’ll be thanking yourself! I’m already happy every morning when I look at how much everything has grown!! Thanks, Allen!! This is the funniest line “Instead she harrumphs to herself in her version of Chinese.” Great. 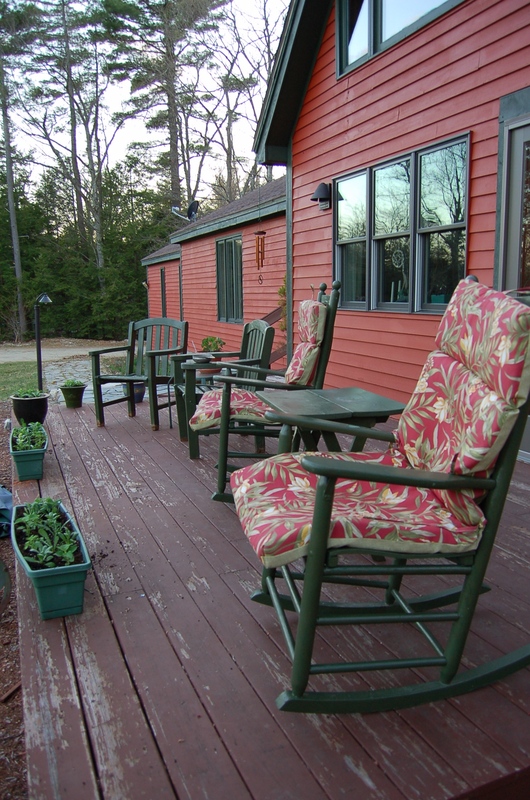 I grew up with lovely rocking chairs like those on a porch ( only your paint is nicer and there are cushions!) My next house will have those. I am determined. 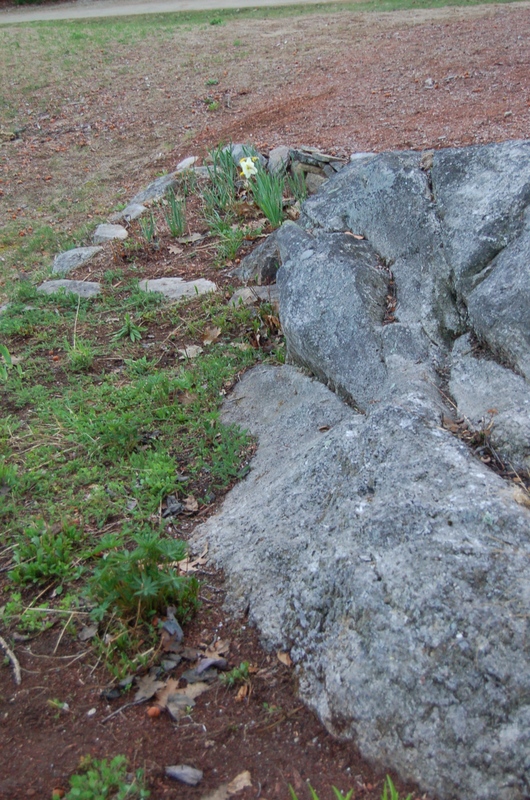 Rocks are so pretty (Easy for me to say…we only have mud and clay and flat). Containers are a smart way to go – impact with less hassle – and you can move them if the plant hates where you thought the spot was perfect. 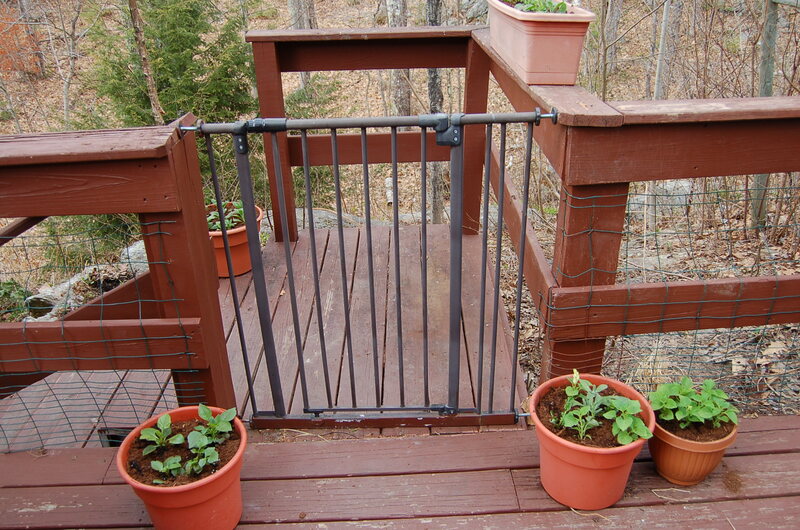 I love your deck and steps – so much to work with. OK. promising to be quiet now! No Phil! Don’t stop!! Do you do house calls?? I love the ideas and will certainly look around for “found” objects and plants!! As to the rocks, many folks actually sell their boulders to landscape companies for the city parks and such. I love my granite rocks. The one in the photo is my Whale rock where I often sit at sunset and just meditate on the day. For the last two years, I have been trying to change my yard, little by little, to be all perennials. The NH Forestry Division sells plants each year. This year I finally got my order in early enough to get everything I wanted. The plants will be small, but the will be native. I ordered a wetlands package for around my ponds, a wildlife package to make the critter happy and 10 rugosa roses to make me happy. 60 plants in all for $60. Your deck looks wonderful. Can’t wait to visit and share a cup of coffee/tea with you some morning soon.